The Oregon Ducks take the field against the Michigan State Spartans in Eugene, Oregon, in September. The Oregon Duck surfs the student section during the first half of the game against the Michigan State Spartans in Eugene, Oregon, in September. The college football playoff committee didn’t make much news when it released its new rankings Tuesday: The top seven teams remained the same. The biggest shift was for Mississippi, which lost badly last week and fell from No. 8 to No. 19. This was in line with what our college football forecast model expected. 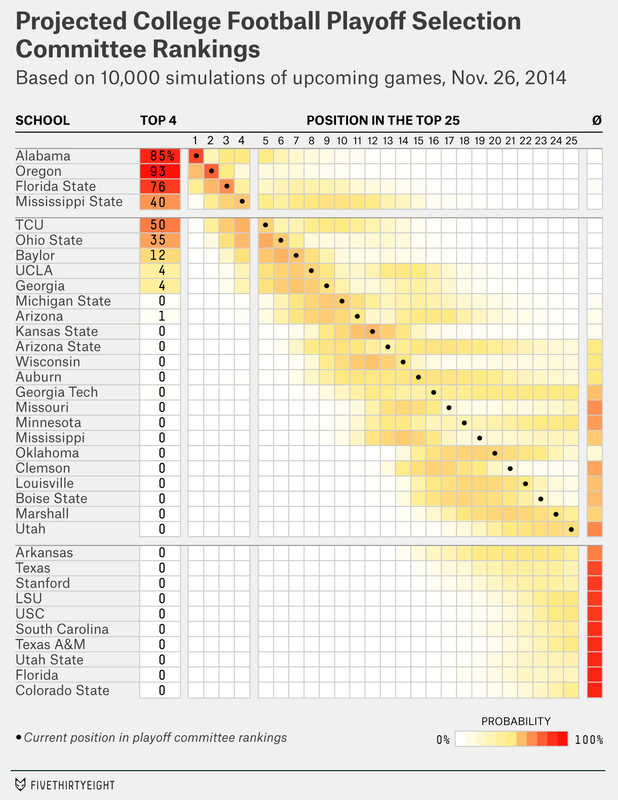 Because the model is based mostly on a historic analysis of the Coaches Poll, this means the committee behaved in the same boring way the coaches usually do — keeping the teams in the same order except when one drops a game and loses its place in line. So, our national championship and playoff odds look very much like they did Sunday. Here’s the more comprehensive version of that chart, which includes the entire Top 25 as they might appear when the committee releases its final standings Dec. 7. The lack of movement may also have been because last weekend was a sleepy one on the college football calendar. This upcoming weekend features much higher stakes, with the top teams facing more formidable opponents and entries into the conference title games on the line. I’m going to run through the top 11 teams in the committee’s rankings as the model sees their chances. In each case, we’ll look at how much a win or loss this weekend would affect the team’s playoff odds along with some more complex scenarios: for instance, if the team loses this week but wins its conference championship next week. Some of the more involved scenarios will expose potential blind spots in the model; we hope it’s still a helpful tool for thinking through the various possibilities. Opponent: No. 15 Auburn on Saturday night. Alabama is a 70 percent favorite according to the model; win probabilities are derived from a simplified version of ESPN’s Football Power Index (FPI). You might expect the No. 1 team’s path to be straightforward. But Alabama’s is one of the more complex cases. That’s because there are really five scenarios to analyze. Two are straightforward: If Alabama defeats Auburn and wins the SEC Championship game, it’s in the playoff, very likely as the No. 1 seed. And if it loses twice, it’s probably out — unless there’s a ton of chaos behind it. The other three are trickier. Alabama could win this week then lose in the SEC Championship. It could lose this week and win the championship. Or it could lose this week and fail to make the championship, which will happen if Mississippi State wins. Failing to make the championship at all is the most dangerous for Alabama; their chances of reaching the playoff would be just 40 percent in that scenario. But the ranking of the other two is debatable. It’s hard to imagine Alabama would be left out if it lost to Auburn but made the SEC title game and won it. The model puts their chances at 75 percent in this case. And that seems too conservative — the alternative would probably entail no SEC team making the playoff at all. Sure, it’s technically possible. If Oregon, Florida State, Ohio State and either Baylor or TCU all win out, the committee would have to bump a zero- or one-loss conference champion for two-loss Alabama. That would be a predicament. But anything short of that exact scenario, and SEC fans from Gainesville to College Station would put aside their differences and come at the committee with pitchforks. A more acute danger might be a win against Auburn followed by a loss to Georgia in the SEC Championship. That way, the committee might get an SEC team into the playoff by choosing Georgia. Georgia needs some help to get into this position. The Bulldogs need Missouri to lose this weekend (Missouri probably doesn’t have the resume to make the playoff even if it wins out) and probably to defeat nonconference foe Georgia Tech on Saturday (otherwise, Georgia’s case will be too weak also). A lot of these questions boil down to how much the committee will emphasize conference championships as opposed to everything else. We don’t have much data on that yet, and neither do the folks in Tuscaloosa. Until we learn more, the only totally safe course for Alabama is simply to win twice. We might ask the same question for Oregon: If it must lose again, is a loss this week or in the Pac-12 Championship better? This case is simpler because Oregon is already assured of making its championship game. The model’s answer is that it’s slightly better for Oregon to lose this week — even against unranked Oregon State — and come back to win the Pac-12 title. The danger of losing the Pac-12 Championship is that Oregon’s Pac-12 opponent could possibly get in ahead of them, especially if it’s UCLA. 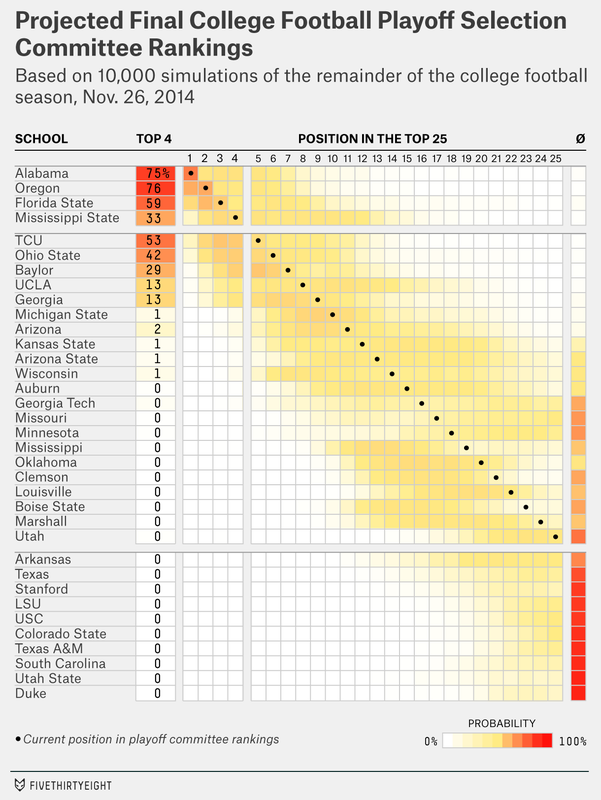 Florida State isn’t at risk of being overtaken by anyone in its conference. (It’s clinched a spot in the ACC Championship and its opponent in that game, No. 16 Georgia Tech, almost certainly won’t make the playoff even if it wins out.) But the committee seems to be down enough on FSU that it probably can’t afford a loss at all. Some of FSU’s problem is strength of schedule, as it has been all year. Neither Florida nor Georgia Tech is likely to impress the committee as an acceptable loss for the Seminoles, even if it wins the other game. Mississippi State has to win this week against Mississippi. FPI has them as underdogs to do so. But the Bulldogs’ chances of making the playoff will more than double to 74 percent if they do. But now we’re going to get a little crazy. Surely, things would be even better for Mississippi State if it won while Alabama lost, which would get them into the SEC Championship game? The model says no: Instead, the Bulldogs should be rooting for Alabama! Here’s why: If Mississippi State wins this week and completes its regular season, that’s probably good enough. It’s already No. 4 and will have notched another big win, on the road, against a ranked rival. Sure, it could eventually be surpassed by a team like TCU, but it could also see a team like Florida State ahead of it lose. It’s a reasonably sound position. But now imagine that Mississippi State wins this week and makes the SEC Championship but loses that game. Instead of a one-loss non-champion, it’s a two-loss non-champion — not so attractive. Furthermore, Alabama would also be a two-loss non-champion in this scenario and one that beat Mississippi State head-to-head late in the regular season. The risk-reward ratio would be poor for the Bulldogs. TCU was helped by the committee this week, which left it at No. 5 even though it was idle. Indeed, the committee’s affection for TCU is a bit bizarre. TCU lost to No. 7 Baylor in October and the more sophisticated computer systems like FPI also have Baylor ranked higher. There’s some thought that Baylor will suddenly jump ahead of TCU if both teams win out. But if the committee has been placing TCU ahead of Baylor for weeks now despite its head-to-head loss, why would it suddenly shift gears? In any event, the model now has TCU’s chances of making the playoff at slightly better than even — and their chances will jump to 79 percent with a win against Texas. However, some of that possibility is contingent on one of the teams ahead of them losing. 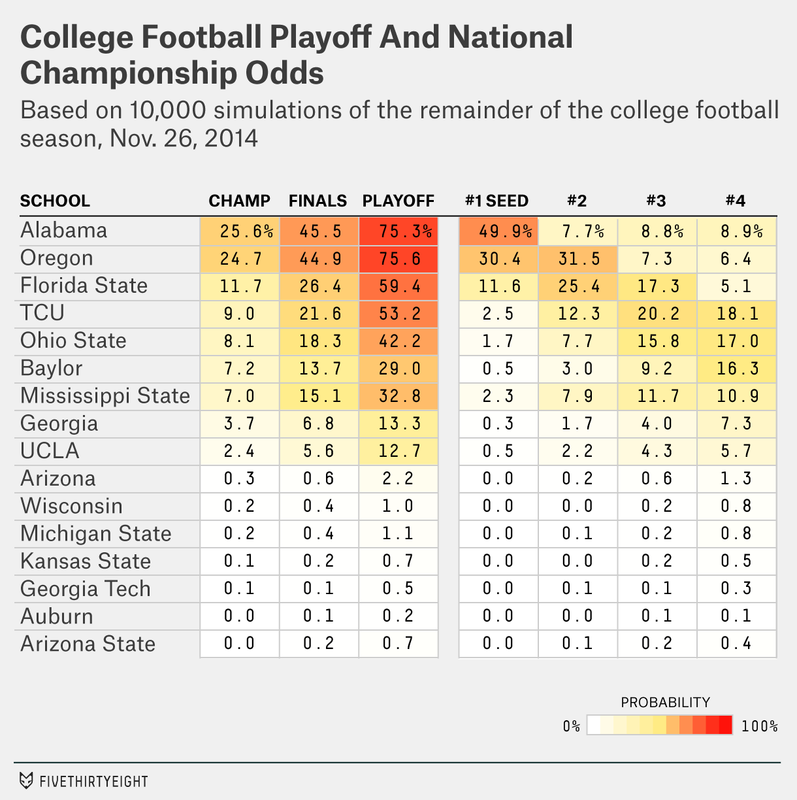 If the top five teams all win out, TCU’s playoff chances will be stuck at about 50 percent. This is one of the simpler cases. Ohio State isn’t assured much of anything, but the team has about a 3-in-4 chance of making the playoff if it wins out, mostly because there’s likely to be some attrition ahead of it. One question is whether the Buckeyes will be ranked ahead of teams like Alabama, Oregon and Florida State if any of the three do lose this week. Those could be close calls for the committee. Not that it needs extra motivation against the Wolverines, but Ohio State might be helped by turning up with a dominant performance against Michigan instead of just getting by. This is a low-stakes weekend for Baylor as compared with the rest of the top teams. The Bears are huge favorites against Texas Tech, and that probable win is already priced into their playoff odds. They have a bigger game against Kansas State next week. Unlike the six teams ahead of it, however, Baylor would be under 50 percent to make the playoff even if it wins out, according to the model. UCLA is about even-money to make the playoff if it wins out and has almost no chance otherwise. Our model thought Georgia might be at some risk of ranking worse than No. 9 in this week’s committee standings; it played a Division I-AA opponent last week, Charleston Southern, while several of the teams ranked just behind them won against (slightly) better competition. The reaffirmation from the committee helps keep Georgia dangerous. The Bulldogs have one more hurdle than UCLA — they need Missouri to lose to make their conference title game while UCLA is in with a win. But if they make the SEC championship and win it, their odds of making the playoff will be close to even. I list this case to demonstrate that when you’re on the outside looking in, you’d rather take a high-stakes path (like the one Georgia has). As I mentioned last week, Michigan State — locked out of its conference title game and with a middling opponent this week — just can’t do enough to impress the committee to jump into the top four. Even if there’s total and utter chaos ahead of Michigan State, its best-case scenario is probably finishing at No. 5 or No. 6. Arizona, like Georgia, at least has a specific path to follow: It’ll need to beat Arizona State, hope UCLA loses so it can make the Pac-12 title game, then beat Oregon there, then hope that one or two teams lose ahead of it. It’s not likely. But the committee might want to find a spot for the Pac-12 champion; it seems to like the conference; the committee ranks Oregon, UCLA and Arizona higher than the AP poll has them. There are a few other teams with a snowball’s-chance-in-hell. Arizona State’s case isn’t fundamentally that different than Arizona’s. Kansas State has an outside chance to finish as the Big 12 champion — again, without the benefit or risk of playing in a championship game — and could be more attractive than the likes of Michigan State if the committee is desperate. Wisconsin could also be a two-loss conference champion if it beats both Minnesota and Ohio State. The model says there’s almost no chance Missouri will get in even with an SEC title, but if the SEC goes haywire and the committee is struggling to represent it, who knows. In any event, here is the model’s probabilistic take on how the standings might look a week from now, accounting for both the uncertainty in this weekend’s games and in how the committee will react to them. CORRECTION (Nov. 30, 11:31 a.m.): A previous version of this article incorrectly claimed that the Big 12 uses head-to-head records as a tiebreaker to determine its conference champion. It does not.